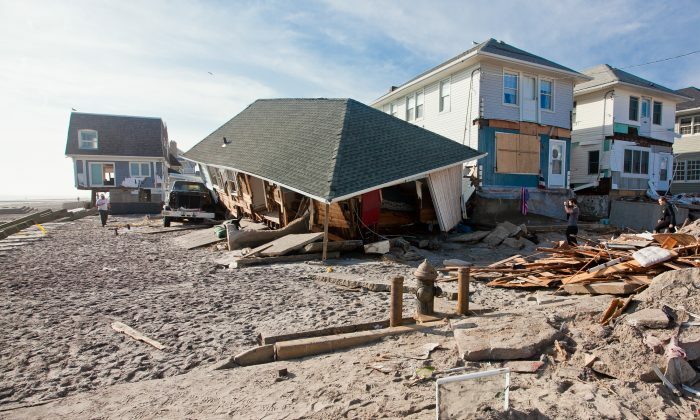 NEW YORK—A retired NYC fireman saw his Rockaway home up to 8.5 feet in water when Superstorm Sandy hit the East Coast last year. Palmer Doyle had flood insurance through the National Flood Insurance Program (NFIP), administered by the Federal Emergency Management Company (FEMA). He only received a fraction of the $250,000 that he’s entitled to receive for property damage and $100,000 for contents. Doyle is just one out of thousands of people who lost property and possessions during the storm, and who is about to see the $430 flood insurance rate premiums skyrocket as a consequence of the Biggert-Waters Flood Insurance Reform Act of 2012. Now a representative for the activist group, Stop FEMA Now, together with other NYC property owners, insurance experts, and congresswomen Carolyn Maloney and Nydia Velázquez, and Doyle demanded the repeal of the act outside a co-op residence along the East River in Uptown Manhattan. “When the Flood Insurance Program was created, they wanted people to pay into the system, but with these high premiums people will be leaving the system, they can’t afford it,” Maloney said. Premiums increase from $5,000 to $10,000 per year according to Maloney, quoting a city report. In some cases it’s even more and also prompts a new risk classification for the affected zones in the FEMA flood zone maps. Doyle said he pays $458 in flood insurance per year, but in the next five years he could be paying upward from $12,000 for the coverage—coverage that he’s not happy with. He claimed $165,000 in property damage and $77, 000 in contents, but received $90,000 for his home and $3,400 for content damage from the flood insurance company. “The national flood program is paying you at 1998 prices as if you were in Missouri,” Doyle said. In Doyle’s case, his neighbor’s closet doors broke through his windows, destroying everything in his children’s rooms including a silver star Doyle’s father got on the Intrepid in World War II, and memorabilia from the 9/11 site where Doyle worked at the time. “It’s taken me a year to rebuild my house. I still haven’t done the outside of the house,” he said. Doyle is in the process of suing the insurance company to recoup the money for his loss. But the meeting’s attendees are not the only ones unimpressed with the reform act. Congresswoman Maxine Waters (D-Calif.) co-sponsored the bill and was “outraged” by the increased costs that resulted from the act. “When I agreed to co-author this legislation, our goal was to create a bipartisan solution to repair our National Flood Insurance Program. Neither Democrats nor Republicans envisioned it would reap the kind of harm and heartache that may result from this law going into effect,” she said in a release earlier in September. The attendees suggested an affordability study which would consider the incomes of residents in the new high-risk flood zones, and that the premiums remain the same or are “grandfathered” even if the area was added to a high-risk zone in the redrafted FEMA map.